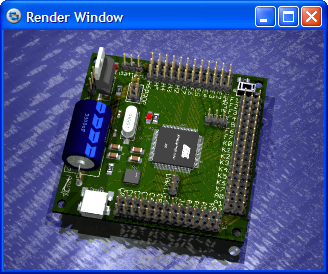 Want to make pretty 3D images of your circuits?
. 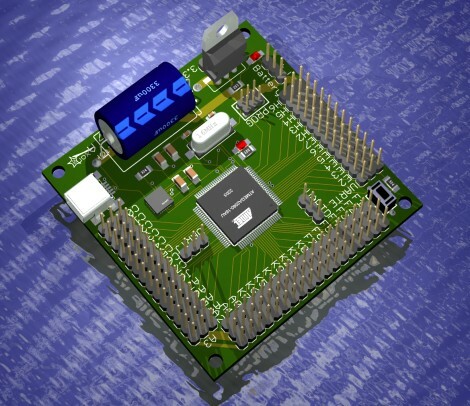 . . while simply using your already designed 2D Eagle board files? I thought so. Enjoy my Eagle3D tutorial! 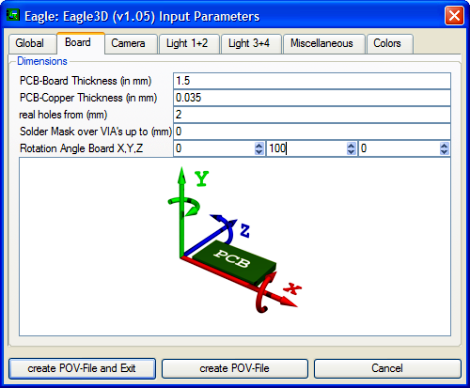 For those still in the dark ages, Eagle CAD is a automated software design tool to create professional PCB circuits. After you have designed your circuit, you would probably next want to view the propagated PCB in 3D for both verification and cool-looking presentations. This is where we will start. When I first started using Eagle3D, it quickly became apparent that the documentation seemed to have forgotten that whole 'how do I use the software?' bit . . . I wasted several hours trying to figure it out . . . And I'm sure many others have as well . . .
but it doesn't actually matter where. 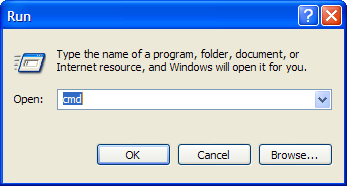 A new window will come up asking you to find a .ulp file. Browse into your Eagle3D directory (where you installed it) and select the file 3d41.ulp. Now select your language, and then browse for the output file (it will only ask you this once). There are tons of options here, such as shadowing, camera angles, lighting, coloring, etc. Don't worry about them for now - the defaults will give you decent results. But you may want to play around with it in the future to get that 'perfect' look. Click create POV-File. This will take a few seconds to process. There is a good chance it will ask you various questions about your board components - answer as best you can. After processing is complete, you will now have a .pov file. You are halfway done! Now you need a post-processor to convert that .pov into a pretty picture . . . Install the 32-bit version POV-Ray (9.7mb) software. If you want more information on this impressive software, feel free to visit the POV-Ray website. We need to point POV-Ray to the .inc files for Eagle3D. These files define the 3D electronics components that will propagate your PCB. Make sure the directory points to where you installed Eagle3D. Now save and close the file. 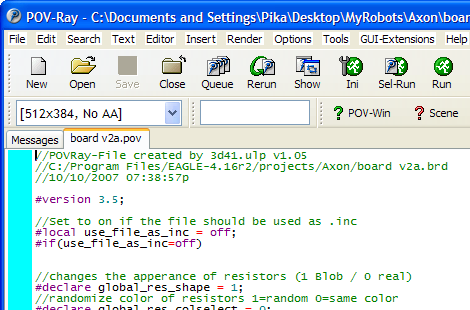 In POV-Ray, click the Ini icon so that we can select an image size. The larger the image, the longer the processing time. When designing the board I like to use a low resolution, but when I have the final product I'll do the maximum size. The max size on my laptop takes less than 5 minutes to process, not too long - but it really depends on how complex the board is. When you are all ready to go, push the Render button. Immediately this 'error' message will pop-up. Just push OK and ignore it. It won't happen again. Feel free to change the camera angle and image sizes. Now chances are not all components have shown up on the board. This is where it gets tricky and so I'll do my best to help you out. There is also a good (bad?) chance you will have to do a little programming, too. 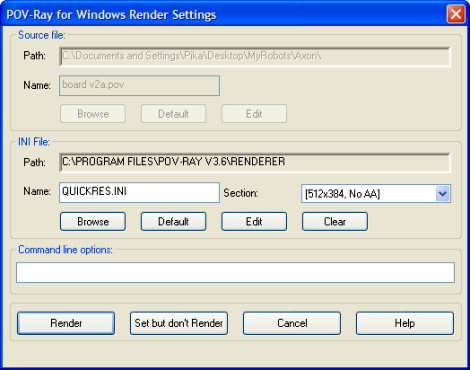 First, click the Open file button in POV-Ray. Locate and open the file user.inc in the Eagle3D\povray folder. Next, click Open again, and change Files of type: to All Files (*.*). Locate and open the file 3dusrpac.dat in your Eagle3D folder. By default, both of these files should be blank. Now we need to change PACKAGE_NAME and MACRO_NAME to actual values. Replace PACKAGE_NAME with the Package variable. In this case it is SD4-01. Note that this is always in caps! Next, we need to find a MACRO_NAME to match your missing part as closely as possible. First you need to locate a part that looks like what you need (or close to it). Download the Eagle3D image library (36mb) and unzip it into a folder. Set the folder options to thumbnail view so you can see them all. Locate a matching component (or as close as possible), and copy the file name onto your clipboard (minus the .png file extension). Once again, using the Open dialog in POV-Ray, go into your Eagle3D\povray and locate the file connector.inc because you needed a connector. If you needed a switch instead, you would use switch.inc. Etc. Now go back to the beginning of this tutorial, recreate the .pov file, and render your image again. If you did everything right, your new component should appear. Step 11 - The hard step!!! Now suppose the selected component isn't exactly the right dimensions . . . well now you are asking to modify the program for that component found in connector.inc. Programming is outside the scope of this tutorial, but feel free to check out this POV-Ray Tutorial. Now I'm definitely no professional programmer, but I will tell you it took me only about two hours of brain frying (guessing until it worked) to create my first part. And I didn't use the tutorial. Play with it for a bit and you will figure it out. Basically all you are doing is defining color, texture, and coordinates of basic shapes. Oh, and you will probably notice that the source code has a lot of German in it. So if you are awesome like me and can't read German, translate it! 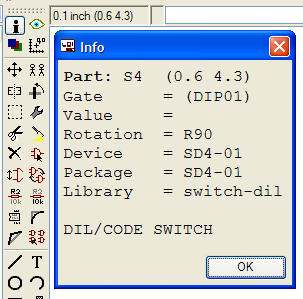 Now for those who don't want to bother programming and have a CAD program, see step 12. Suppose you don't want to bother programming to create shapes in .pov, and instead just want to convert you CAD files (from another program) into .pov code. This can potentially save tons of time! First, using your preferred CAD program, save your CAD file as a .stl. This file type is an industry standard. 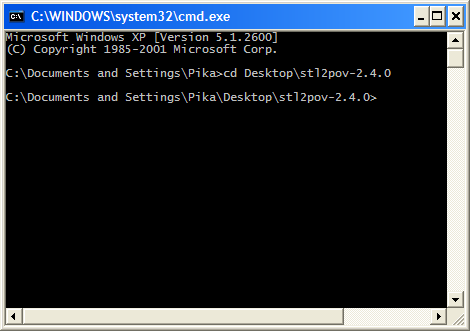 Next, download this small .stl to .pov conversion utility. For more info and source code, feel free to check out the stl2pov homepage. Unzip the file. Then type 'stl2pov input.stl >output.inc', where input is the name of your .stl file and output is the desired output pov file. Optionally, you can also type 'stl2pov input.stl|more' for more stuff. Push enter. note: in v3.0, do not use the > character. Save this new DrawSTL.pov file wherever. Now just Render it as described in Step 6 and higher.